Major Jeffrey Forde is a Barbadian born career military officer who served with the Barbados Defence Force (BDF) for 25 years. During his time in the military, some of the professional courses attended by Major Forde included commando courses in Barbados, UK and Martinique, Captain Career courses at Fort Benning and Fort Huachuca in USA, Close Protection Course in UK, Crisis Negotiation Course and Peacekeeping Management in Canada and Command and General Staff training in the People’s Republic of China. The major appointments held by Major Forde were: Force Training Officer, Company Commander of Commando Squadron, Staff Officer Operations and Training, Staff Officer Intelligence, Aide de Camp to Governor General – Her Excellency the Late Dame Nita Barrow, Detachment Commander in Haiti, Second in Command and Acting Commander of The Barbados Regiment. Major Forde was awarded the United Nations Medal for Service in Haiti and the Medal of Honour for Meritorious Service to the Barbados Defence Force. He received letters of commendations from Prime Ministers of St. Vincent and Trinidad and Tobago for his service during operations in their countries. 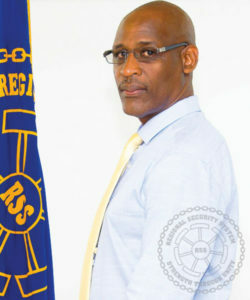 On retiring from the regular element of the Barbados Defence Force in 2010, Major Forde joined the private sector as a security consultant. He joined the Regional Security System Headquarters in February 2013, as the Regional Intelligence Officer. His focus is on building capacity of the intelligence units within the Regional Security System. He is currently the acting Director of Operations and Plans where he is principally responsible for the mobilisation of service personnel in the event of a national emergency. He is also a trained polygraph examiner. He is a member of the American Society of Industrial Security and a member of the American Polygraph Association. He recently sat as a Council member for the Barbados Legion. He is married and has one son and two daughters and two granddaughters. His hobbies are reading, watching documentaries and will be taking back up photography and scuba diving for relaxation.